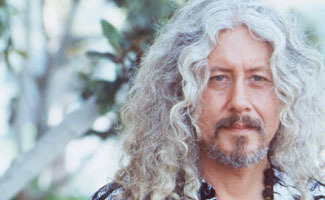 Arlo Guthrie's career exploded in 1967 with the release of "Alice's Restaurant," which became nothing less than an anthem of an entire age, fostering a new commitment among the '60s generation to social consciousness and activism. His stock in trade comes in the form of classically styled folk songs intermingled with clever storytelling, always reminding one and all of his father, the beloved singer/writer/philosopher Woody Guthrie. Now Arlo gathers three generations together on one stage with his Guthrie Family Rides Again program, in which the entire clan performs favorite songs, Arlo's standards, and a selection of unpublished Woody Guthrie lyrics put to music by friends and family. "The Guthries are the first family of American folk. They practice what Woody preached" (Vanity Fair). Born in Coney Island with a guitar in one hand and a harmonica in the other, Arlo grew up surrounded by folks like Pete Seeger, Ronnie Gilbert, Leadbelly, Ramblin' Jack Elliott, Sonny Terry, and Brownie McGhee, all of whom were significant influences on his musical career. He was a common sight at the most famous venues of the "Folk Boom" era, like New York's Gerdes Folk City and Boston's Club 47. His style gained further inspiration from beat poets like Allen Ginsburg and Lord Buckley, and players he picked with like Bill Monroe and Doc Watson. Arlo learned something from everyone and developed his own style, becoming a distinctive, expressive voice in a crowded community of singer-songwriters and political-social commentators. In addition to his accomplishments as a musician, playing the piano, six and twelve-string guitar, harmonica, and a dozen other instruments, Arlo is a natural-born storyteller, whose tales and anecdotes figure prominently in his performances. The Freight & Salvage co-presents this singular event with Cal Performances as part of their World Stage Series.